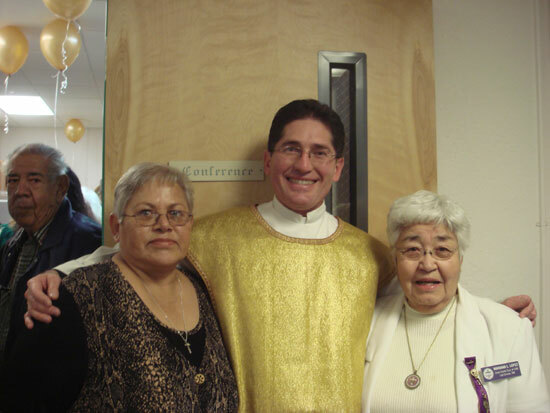 Our pastor Father Ricardo Bauza with Rosemary Leyva (President of the St. Genevieve Historical Society) and Mariana Lopez. Many items of the old church were displayed for this occasion so people could appreciate our past. Members of the St. Genevieve Historical Society: Father Ricardo Bauza, Christopher Williams, Renee Allison, Rosemary Leyva, Derek Rubio, Liz Portillo, and Stephen Elchlepp. 1859-2009, Celebrating 150 years of community. Seminarian Christopher Williams and Bishop Ricardo Ramirez. Father Juan Moreno is having a bite to eat. The conference room was decorated with golden balloons to mark the beginning of the 150th anniversary. People look at the pictures displayed showing our history. Jaime Flores is caught at the museum-like display. Smile, Socorro. This picture will go to the Las Cruces Sun News. Members of the St. Genevieve’s Knights of Columbus. Some of the stain glass windows from the old church displayed during our celebration. Parishioners celebrating 150 years of community.